We report a case of a 64-year-old male who, 44 days after starting treatment with prasugrel, presented with severe thrombocytopenia, anemia, renal failure, and severe ADAMTS13 activity deficiency, along with a high titer of autoantibodies to this protease. George JN, Leung LLK, Tirnauer JS. Drug-induced thrombotic microangiopathy. 2015 Uptodate. http://www.uptodate.com/contents/drug-induced-thrombotic-microangiopathy visited on 30/05/2016. Al-Nouri ZL, Reese JA, Terrell DR, et al. Drug-induced thrombotic microangiopathy: a systematic review of published reports. Blood 2015;125:616-618. Reese JA, Bougie DW, Curtis BR, et al. Drug-induced thrombotic microangiopathy: Experience of the Oklahoma Registry and the Blood Center of Wisconsin. Am J Hematol 2015;90:406-410. Jacob S, Dunn BL, Qureshi ZP, et al. Ticlopidine, Clopidogrel and Prasugrel-Associated Thrombotic Thrombocytopenic Purpura: A 20-Year Review from the Southern Network on Adverse Reactions (SONAR). Semin Thromb Hemost 2012;38:845-853. Zakarija A, Kwaan HC, Moake JL. Ticlopidine and clopidogrel-associated thrombotic thrombocytopenic purpura (TTP): Review of clinical, laboratory, epidemiological and pharmaco vigilance findings (1989–2008). 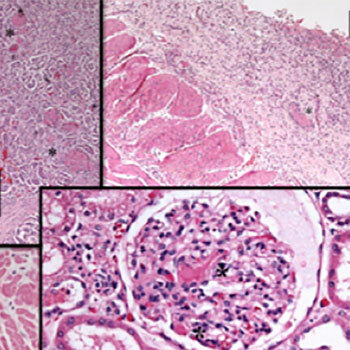 Kidney Int 2009;75:S20-S24.